Easily include real-world video shot in 360 degrees. See in Glossary complexity in VR by including a pre-rendered backdrop video instead of real geometry. Unity supports 180 and 360 degree videos in either an equirectangular layout (longitude and latitude) or a cubemap layout (6 frames). 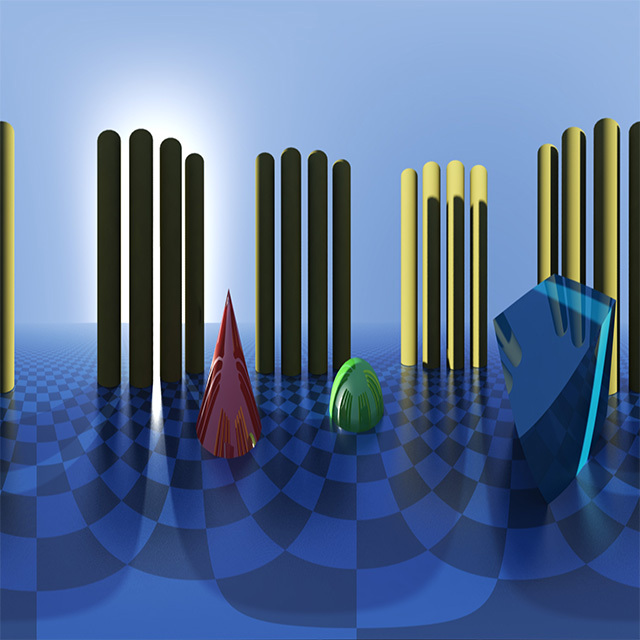 Equirectangular 2D videos should have an aspect ratioThe relationship of an image’s proportional dimensions, such as its width and height. See in Glossary of exactly 2:1 for 360 content, or 1:1 for 180 content. 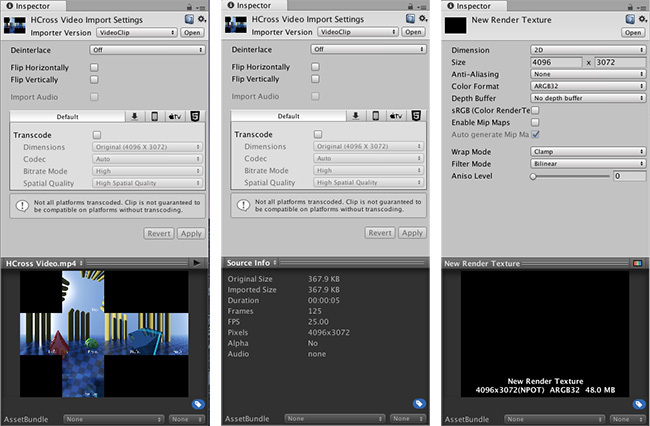 To use the panoramic video features in the Unity Editor, you must have access to panoramic video clips, or know how to author them. Set up a Video Player to play the video source to a Render Texture. Set up a Skybox Material that receives the Render Texture. Set the Scene to use the Skybox Material. Note: This is a resource-intensive feature. For best visual results, use panoramic videos in the highest possible resolution (often 4K or 8K). Large videos require more computing power and resources for decoding. Most systems have specific limits on maximum video decoding resolutions (for example, many mobiles are limited to HD or 2K, and older desktops might be limited to 2K or 4K). See in Glossary. Press Play to view this. See in Glossary window. Scroll to the section where Unity previews your video, select your video’s name in the preview window, and change it to Source Info. See in Glossary option to No depth buffer. Now, open the Video Player Inspector and switch the Render Mode to Render Texture. Drag your new Render Texture from the Asset view to the Target Texture slot. Enter Play mode to verify that this is functioning correctly. The video doesn’t render in the Game window, but you can select the Render Texture Asset to see that its content updating with each video frame. You need to replace the default Skybox with your video content to render the panoramic video as a backdrop to your Scene. See in Glossary > Panoramic). 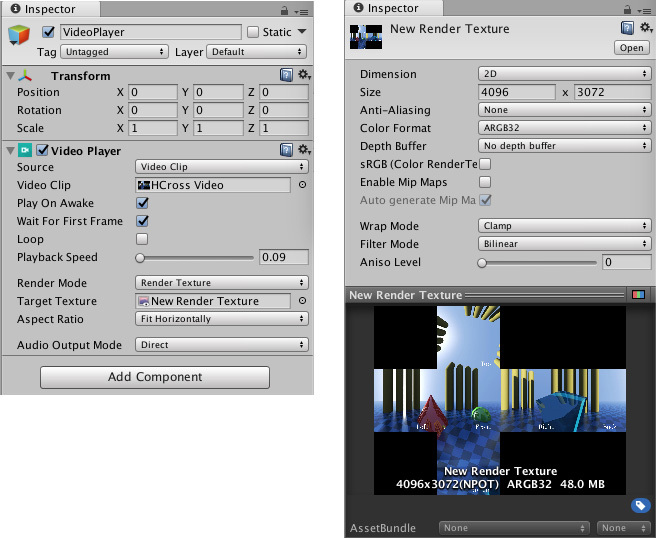 Drag the Render Texture from the Asset view to the Texture slot in the new Material’s Inspector. You must correctly identify the type of content in the video (cubemap or equirectangular) for the panoramic video to display properly. 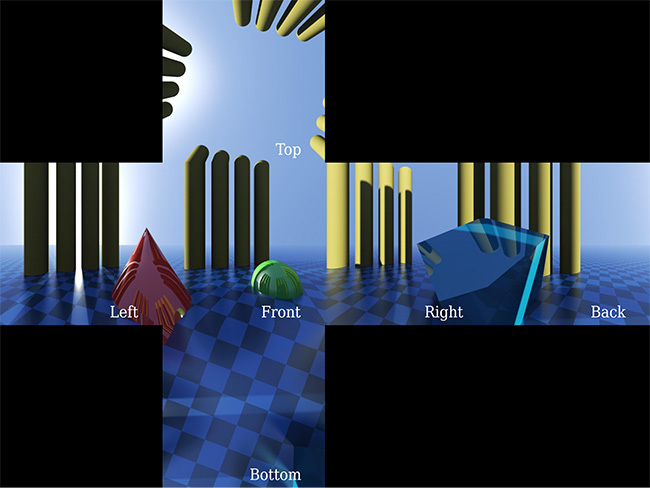 For cubemap content (such as a cross and strip layout, as is common for static Skybox Textures), set Mapping to 6 Frames Layout. For equirectangular content, set Mapping to Latitude Longitude Layout, and then either the 360 degree or 180 degree sub-option. Choose the 360 degree option if the video covers a full 360-degree view. Choose 180 degree if the video is just a front-facing 180-degree view. Look at the Preview at the bottom of the Material Inspector. Pan around and check that the content looks correct. Finally, you must connect your new Skybox Material to the Scene. Open up the Lighting window (menu: Window > General > Lighting Settings). Drag and drop the new Skybox Material Asset to the first slot under Environment. Press Play to show the video as a Scene backdrop on the Skybox. Change the Scene Camera orientation to show a different portion of the Skybox (and therefore a different portion of the panoramic video). See in Glossary, then select the Player category, and open the XR Settings panel), especially if your source video has stereo content. This unlocks an extra 3D Layout option in the Skybox/Panoramic Material. The 3D Layout has three options : Side by Side, Over Under, and None (default value). Use the Side by Side settings if the video contains the left eye’s content on the left and the right eye’s content on the right. Choose Over Under if the left and right content are positioned above and below one another in the video. Unity detects which eye is currently being rendered and sends this information to the Skybox/Panoramic shader using Single Pass Stereo rendering. The shader contains the logic to select the correct half of the video based on this information when Unity renders each eye’s content in VR. 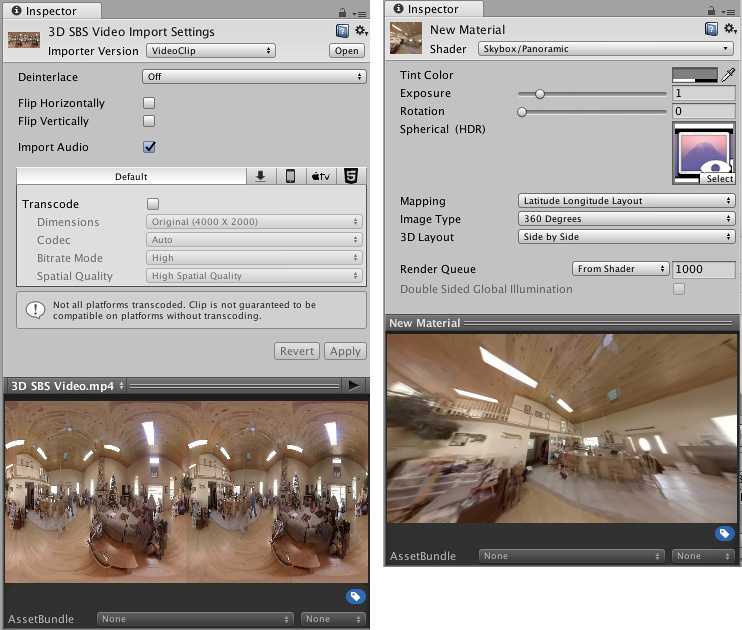 For non–360 3D video (where you shouldn’t use a Skybox Material), the same 3D Layout is available directly in the Video Player component when using the Camera Near/Far Plane Render Modes. See in Glossary to a 2D Render Texture and preserving the exact cube map layout, you can render the Video Player directly to a Render Texture Cube. To achieve this, change the Render Texture Asset’s Dimension from 2D to Cube and set the Render Texture’s Size__ to be exactly the dimensions of the individual faces of the source video. For example, if you have a 4 x 3 horizontal cross cubemap layout video with dimensions 4096 x 3072, set the Render Texture’s Size to 1024 x 1024 (4096 / 4 and 3072 / 3). While rendering to a Cube Target Texture, the Video Player assumes that the source video contains a cube map in either a cross or a strip layout (which it determines using the video aspect ratio). The Video Player then fills out the Render Texture’s faces with the correct cube faces. See in Glossary) instead of the Skybox/Panoramic Material described above. Including 3D content requires double either the width or the height of the video (corresponding to Side-by-Side or Over-Under layouts). Keep in mind that many desktop hardware video decoders are limited to 4K resolutions and mobile hardware video decoders are often limited to 2K or less which limits the resolution of playback in real-time on those platforms. You can use video transcoding to produce lower resolution versions of panoramic videos, but take precautions to avoid introducing bleeding at the edge between left and right 3D content, or, between cube map faces and adjacent black areas. In general, you should author video in power-of-two dimensions and transcoding to other power-of-two dimensions to reduce visual artifacts.